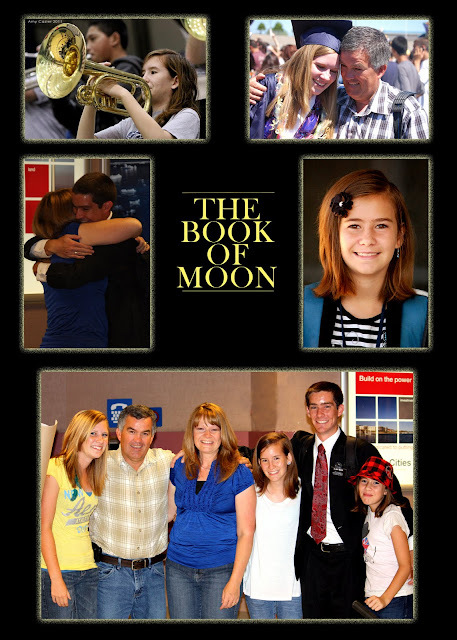 Here is this year's chapter in "The Book of Moon." The Moon Family rejoices and is blessed. BEHOLD, in the twenty-third year of the Tom and Terri Moon Family, there was much rejoicing. 2 And it came to pass, Cameron, having served honorably in the wilderness of Florida for the space of two years, did return home. Yea, the Moon Family was filled with much joy and rejoiced at his return. And, he did tarry for a short time, before traveling to the land of BYU in Rexburg. 3 And it came to pass, Courtney continued in her rebelliousness, and became eighteen. Yea, she accomplished high school, and worked mightily over the hot months that she might travel to the land of BYU with her brother. Yea, she did heed not the warnings of her mother and her father, and found favor in the eyes of a young man. 4 And it came to pass, Maddy continued in her love of her horn and Phantom and of bacon. Yea, she marched upon the wilderness and blew her horn. And she took possession of her sister’s bedroom on the first morning of her leaving. Yea, she rejoices much in her new room. Now, Maddy, being fifteen continues to gain knowledge as a sophomore in high school. 5 And it came to pass, Mckenna being eleven; increased in knowledge, insomuch that she became a sixth grader. Yea, she did prosper in middle school. And she did continue playing music, yea; she began to learn the bass clarinet. And she also rejoiced at having her own room. 6 And it came to pass, Tom, having labored diligently and with much love, for the space of nearly 6 ½ years, was released from his calling of Bishop. Yea, he did hearken to the words of his wife, and began to finish the basement. For, lo, Cameron and Courtney have no place to dwell in the home. 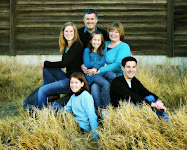 7And it came to pass; Terri did continue to find joy in her family. For, family is the most precious and desirable above all things. 8 For behold, the Moon family’s burdens have been made light, Insomuch that the windows of heaven have opened and poured blessings upon them. 9 And, verily, the Moon family makes an end of writing concerning these things for a time.